Johann Zarco makes no excuses when accepting his fade during the middle chunk of the MotoGP season but upon his final Monster Yamaha Tech3 bow the exciting French rider reflects on his opening chapter in the premier class with pride. Arriving as a two-time Moto2 world champion at Tech3, Zarco delivered headline-grabbing feats instantly when he led the his maiden MotoGP race for seven laps in Qatar before crashing out. In a standout rookie year, the Frenchman demonstrated his quick leaning and adaptable approach which delivered top five finishes in the following four races after Qatar including an emotional debut podium appearance at his home event at Le Mans. A mid-season lull, which applied to all Yamaha riders as the Japanese manufacturer’s technical problems began to emerge, was forgotten with a flourish at the end of 2017: 4th place at Phillip Island, 3rd place at Sepang and 2nd place at Valencia. Turning the page 12 months on and on paper at least Zarco appears to have suffered the same story with a strong start to the year – poles at Losail and Le Mans along with podiums in Termas de Rio Hondo and Jerez – followed by a results drought coinciding with one of European’s hottest-ever summers. But Zarco’s off-track attention has certainly been busier this time around with his factory KTM deal being confirmed in early May plus the intense change in dynamic with long-term ally Laurent Fellon who went from manager to rider coach. 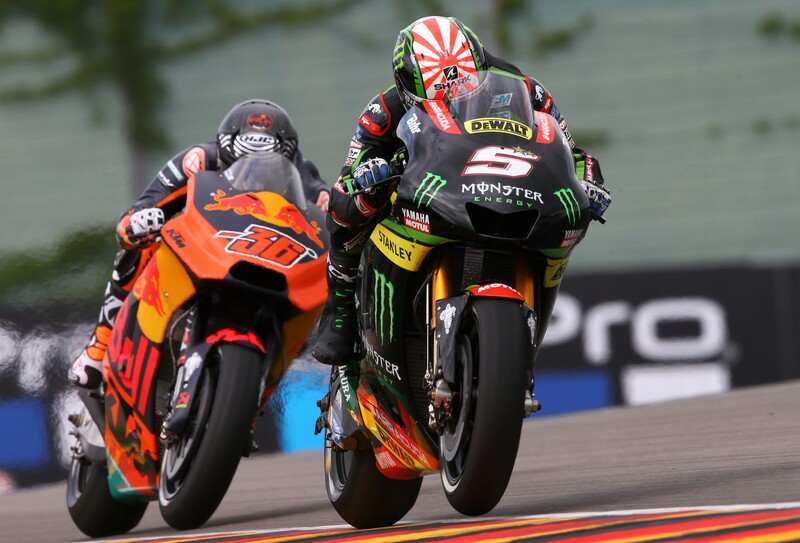 With his future sown up very early into the season, like many of his rivals as it became a common act this year, and behind-the-scene shifts taking place it fuelled rumours Zarco had gone off full throttle. Naturally, it is something Zarco refutes instantly and reasons his own explanation on why his 2018 went south even among the Yamaha head-aching and apologising saga. “No. Since my beginning in world championships even if I was able to fix the future situation I was never thinking about the future,” Zarco told Crash.net. “I was giving the best in the same way every weekend. Zarco concedes learning to accept his own limitations, whether it was led by personal or bike problems, was the first step in seeing the ‘old Zarco’ return. “When you feel you can ride like the other riders but during the race you are not able to follow them,” he explained. “You don’t do anything worse than before but you get frustrated because you feel that you cannot do more but the guys in front are not better than you. That is the worst moment. “But when you have a good race and you feel you have a good race and good work with the team and the bike, but you are only fifth or sixth, then you really need to take a step back and analyse that it is maybe the best thing possible from that weekend. “If I am in the best position that we could do it is a way to see the positives and keep energy up for the next round. Even though results continued to drift Zarco has remained focused to strike when the breakthroughs arrived. Encouraging top sixes at Buriram and Motegi may have been stalled by a scary accident with Marc Marquez at Phillip Island but his pace was undoubtable and having seen factory Yamaha’s Maverick Vinales break the manufacturer’s winless stretch in Australia it was a case of what could have been. Wary of not passing up another opportunity, Zarco’s charge to third place at Sepang has seen him overhaul the injured Cal Crutchlow for the top Independent spot in the riders’ championship ahead of the 2018 season finale. Zarco goes to Valencia needing to defend a five-point advantage over Pramac Ducati’s Danilo Petrucci, with Crutchlow absent again, and feels given his own challenges coming out on top in the Independent category would mark a successful final chapter with Tech3. The top Independent MotoGP honour would be the ideal leaving present as he says goodbye to Tech3 and Yamaha as he follows the same path as his predecessors, Pol Espargaro and Bradley Smith, by moving to Red Bull KTM. Zarco will be one of a handful of riders starting afresh, beginning at the post-season Valencia test, and while the serious work will be undertaken in the garage and over the winter the 28-year-old is hoping to ride with a smile on his face. “My expectations for the test are to have a good feeling and enjoy myself on the bike immediately,” he said. “That’s my best wish. “I know we are going to have a good test and a good winter to prepare for the start of the season. I saw a team and a brand with a lot of motivation that I think gives me a lot of motivation and happiness to go there and wish for the best things. “I think my first moments on the KTM I will ride Zarco-style and then I think I will improve the Zarco-style. In a career which took off by becoming the first-ever Red Bull Rookies’ Cup champion 11 years ago, racing two-stroke KTM RC 125cc bikes, the narrative is clear for the French rider. He starts his new chapter when he leaves Valencia’s Circuit Ricardo Tormo as a Tech3 rider on Sunday night to return Tuesday morning with Red Bull KTM. What remains to be written will be fascinating.